Puppet is a system that is used for automating system administration tasks. Almost all system administrators try to get rid of their daily repetitive and boring routine tasks with the help of scripting to automate them. But there are issues with scripting and automating, that is why we prefer to use Puppet configuration management tool that is extremely powerful in deploying, configuring and managing a server machine. Puppet keeps the configurations of your hosts under check and can used in one shot to configure a machine from scratch like installing packages, configurations and to create and manage users. Let’s see how it works for a master and client installation and configuration on Ubuntu 14.04 that will consists of central Puppet Master Server where all of your configuration data will be managed and distributed, while the remaining servers will be acting as Puppet Agent nodes, which can be configured by Puppet Master Server. We will be using two virtual machines in this tutorial with Ubuntu 14.04 operating system installed on these with their static IP addresses and hostnames configured properly. Let’s open the /etc/hosts file and configure it according to your infrastructure environment. 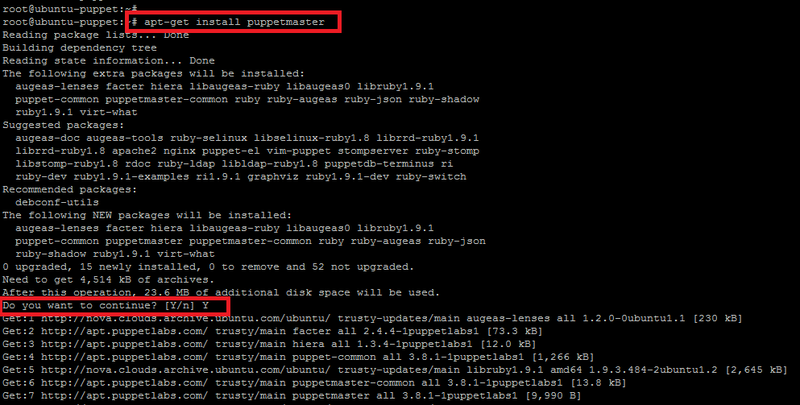 Where the ubuntu-puppet will serve as Master Puppet while we will install its agent on ubuntu-client. Since Puppet is not in basic Ubuntu distribution repositories, we have to add a custom repository provided by Puppet Labs. On all servers in which you want to use Puppet, download and install the repository by executing following commands on each server. To install the downloaded repository from puppet labs, let run the following commands to install. Now update your system with latest packages and repositories with below command on each server. The server acting as a puppet master should have its system time set accurately. To set, accurate system time you should probably use NTP service. 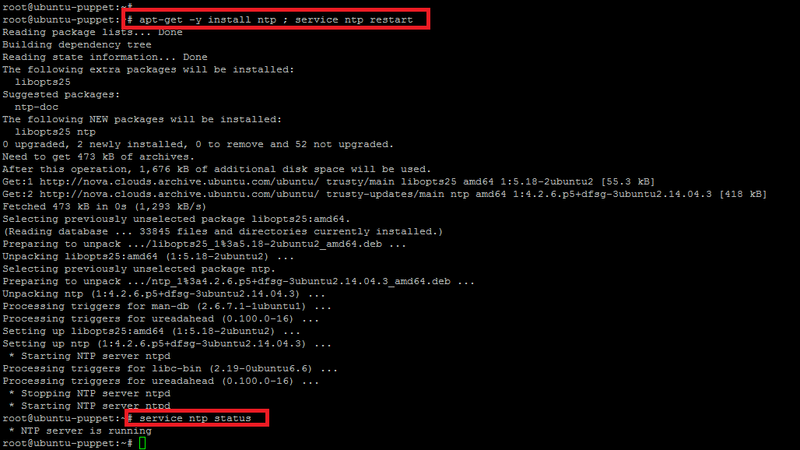 Use the following command to install ntp server on your master puppet server. Now we are ready to proceed with the install installation of puppet packages which will fetch all necessary prerequisites and requirements. Once system time is set correctly, you can install latest versions of Puppet using Puppet Labs package repository on your correspondent Linux versions. The output shows the successful installation of puppetserver and its running services. We can check the puppet version with below command. Now we need to lock the puppet version update as this will hamper the configurations while updating Puppet. It will not update Puppet while running updates in the system. We can do these settings by creating a new file with following configurations as shown. To configure puppetmaster, we need to change its puppet.conf file, where we will just comment out this line templatedir=$confdir/templates while other parameters will remain as same. After making required changes to the configuration file now restart master puppet services. At this stage our master puppet server is ready, now let’s move towards its client setup on another virtual machine with Ubuntu 14.04 Operating system installed. As we had already done with installation of its prerequisites, now simply run the following command to install puppet client on the host that will be interacted with Puppet Master Ubuntu server. In the same way as we did for Puppet master server, we will lock the Puppet version so that it may not cause any issue during the operating system updates. To check the installed puppet version use puppet -V command and then create a new file called in the apt preferences directory with following configurations changes. Now it will not update the Puppet while running updates in the system, so let’s proceed with Puppet client configuration in following steps. Open the configuration file of puppet client by using any of your favorite editor and configure its parameters as shown. We will comment out the [master] configurations here and will add the new lines under [agent] as shown. To enable puppet service we have to make changes in its default configurations file. Setting this to “yes” allows the puppet agent service to run. Save the changes and start puppet agent services with below command. The output shown confirms that our client machine is ready to communicate with puppet master server. Now we are going to generate new certificates for Master Puppet to Client Puppet communications because after successful configuration of Puppet client it will search for Puppet master Server and ask for cert request before accepting any administrative instructions from Master puppet server. Let’s run the command at Puppet Master Ubuntu server to view such cert requests. The above output shows that the ubuntu-client came to master Puppet and ask for certs request. Now the puppet master server must sign the cert requested from puppet client with following command. It means that the request from the Client Puppet has been accepted by the Puppet Master server. To confirm we can check this by executing the following command at Master Puppet server as. Where the + sign in the output shows the successful certificate signing at the master puppet server. We can also view the certificates fingerprint on the client puppet machine by running the following command on the Client Puppet machine as below. Similarly we can add any number of clients with Puppet master Ubuntu Server and sign the cert requests from the clients and do the administrations centrally through the Puppet Master server. Greetings! We have successfully installed and configured a Puppet server, and set up its basic configuration for client servers with fully functional Puppet instance on our Ubuntu 14.04 with its Client puppet installations and configurations. So, Puppet automation tool seems robust, user friendly interface, as well as very declarative with an easy installation. Feel free to contact if you need further assistance while you are preparing your own Puppet Master/Client setup on Ubuntu.